“We have to become the best version of ourselves we can be, that is our sacred human contract”—Albert Einstein. How right you were, Mr Einstein; to live the most ethical lives we can is the key to a kinder world. When we devote our lives to becoming the best version of ourselves, we undertake the most extraordinary adventure imaginable. Awareness is power: it provides us with the power to change, yet if we are not aware of why we do what we do even though we know what we know, how can we even think to make an impact on this world in our lifetime? Emotions and feelings are there to guide us home, to our inner home. Yet we tend to ignore or suppress the ones that make us feel less than great. We don’t like to go there because we fear what the answer may be. Purpose-based leaders are the ones that go there because they know that when you shine a light on the darkness it disappears. When we do the inner work then the outer work is magnified. When we break through limiting beliefs and sabotaging habits we have the key to unlock our genius. What used to stress us out no longer bothers us. We play a bigger game and in doing so we have the potential to create a larger impact on the world. The documentary Unity by director Shaun Monson explores humanity’s hopeful transformation from living by killing into living by loving. It is a unique film about compassion for all beings, or all expressions of life going beyond all separation based on form and beyond perceiving opposites. The world is calling us to wake up and step into our light. To express the truth of who we are in the service of what we are called to do. What if we didn’t let fear, stress, and fatigue slow us down? Where would you be if you had more than enough energy to make it through your day? And what if that day involved you doing something that helped heal our planet in some small but significant way? Imagine putting voice and action to your calling because you overcame the struggle involved in reaching that calling. Think of how amazing it will feel when you achieve your desires because you decided to become the best version of yourself possible. 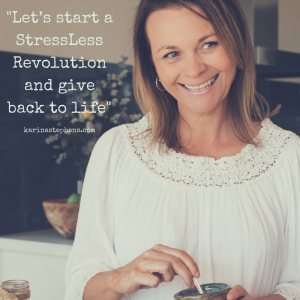 When coming up with the name of the StressLess Revolution, I debated and pondered long and hard if revolution was the correct word. To me it felt more stressful rather than StressLess. We create a revolution by change, by saying enough is enough. When I meditated on this what I felt was revolution needs to come from evolution. Meaning we need to evolve and grow and raise our vibration, and as we do we become the empowered beings capable of creating change in this world. If anything, I think that what we have learnt by today’s fast-food, fast-paced, ASAP rat race is that it’s not really working for us. We are more stressed out than ever before. Our planet has never been in such a state of dis-ease, our animals are suffering and I believe it has never been more important to wake up and do something. As we take the time to work on our inner world our outer world will alchemise. When your body is in alignment with your life purpose your purpose lines up with your life. We become conscious leaders in our families, in our neighborhood, our community, in our circle of influence. Marianne Williamson once wrote, “I will go at the slowest part of me.” That’s what conscious StressLess leaders do. Their lives are integrated with habits, rituals, and beliefs, which minimise the stress in their lives, which in turn keeps them in the groove of life. Conscious communication with your inner self will set you apart from everyone else for life. Being aware of your beliefs, your internal dialogue, your thoughts and feelings, and the physical sensations in your body can literally heal your life. Our truth leads us to our divine potential. When we really, truly love ourselves and honor the truth of who we are, we break through whatever limits us. Creativity explodes, serendipity dances with synchronicity, and life as we know it will never be the same again. Our body aligns with its natural state, free of toxicity, blocks from chronic stress, dis-ease, and stress, then the organs and systems have a chance to completely recharge when resting. Then when you go about your day, your body can operate at optimal capacity, being fully awake, present, and charged with a magnified life force, where all areas of life start to come into balance. We all want the same things: to love and be loved, to matter, to feel worthy, and to be the best we can be, yet we let our thoughts get in the way of experiencing all of this. We rush around trying to prove ourselves, and all we gain in the process is to feel like we are still not good enough. We race after this goal and that goal, all the time forgetting that the ultimate goal is to know peace, joy, and love. We live unconscious lives, moving with whatever pace society dictates, but life has a different pace, and it’s here where you step off the treadmill and onto a road that will lead you towards more happiness than you can imagine. This road is not governed by dictatorship; it is not fueled with unkindness and fear. This road is your road; you decide where it leads, you dictate the outcome, and you determine the elements it is made up of. You get to decide how fast or how slow you go based on divine guidance. It’s your choice: are you going to let stress, struggle, and fatigue keep you on the treadmill, always seeing the same things, never getting anywhere, just repeating the same day every day? Or are you going to choose ease, joy, and abundance, living life at the Pace of Grace and creating a StressLess Revolution? 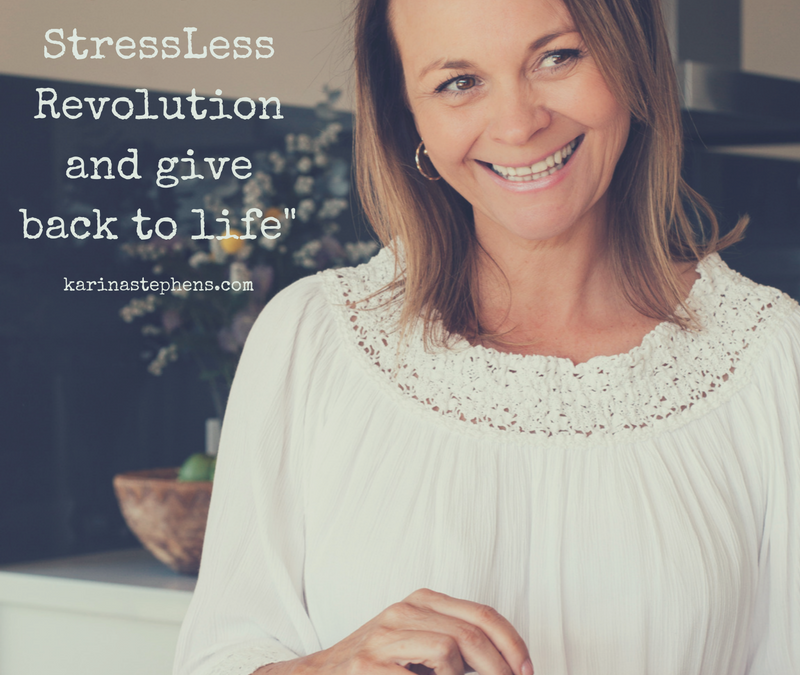 For more ways to live a StressLess life go to http://www.karinastephens.com/the-stressless-revolution-book/ and grab your very own copy of the book.